Pope Francis finished off his trip to Brazil with one last unscripted moment by holding a 1 hour and 20 minute press conference during the flight back to Rome. The July 28 meeting with journalists covered everything from the canonization of Blessed John Paul II to an investigation of a Vatican monsignor who allegedly lived in a homosexual relationship. Monsignor Battista Ricca was recently made secretary of the commission of cardinals that oversees the Vatican bank. He was the target of an internal investigation after Italy’s L’Espresso magazine accused him of improprieties while working at the papal nunciature in Uruguay from 1999 to 2001. Further inquiry “found nothing,” said the Pope. “I’d like to add,” the pontiff said according to news reports, “that many times we seem to seek out the sins of somebody’s youth and publish them. We’re not talking about crimes, which are something else. The abuse of minors, for instance, is a crime. “But one can sin and then convert, and the Lord both forgives and forgets. We don’t have the right to refuse to forget … it’s dangerous,” he said. Pope Francis also revealed that the date for the canonization of Blesseds John XXIII and John Paul II will probably not be this coming Dec. 8., due to the winter weather that would make travel from Poland difficult at that time of year. Cardinal Stanislaw Dziwisz of Krakow, Poland suggested that the late November feast of Christ the King or next spring’s Feast of Divine Mercy are two possibilities, the Pope explained. Among other important issues the Holy Father addressed were: the reform of the Vatican’s Institute for Religious Works, commonly called the Vatican bank, the need to develop a deeper “theology of women” in the Church, and whether or not he would accept someone with a homosexual tendency as a priest in his diocese. Pope Francis reiterated the Church’s belief that having a homosexual orientation is not sinful but engaging in homosexual acts is. “Who am I to judge a gay person of goodwill who seeks the Lord?” he said in response to a question about whether he would accept a celibate, homosexual priest in his diocese. “It (the Catechism) says they should not be marginalized because of this but that they must be integrated into society,” he added, according to the BBC. The Pope made his remarks as he addressed the possibility of a “gay lobby” within the Vatican, which has been the subject of discussion in the Italian press. “There’s a lot of talk about the gay lobby, but I’ve never seen it on the Vatican ID card!” he joked, according to John Allen of the National Catholic Reporter. “You have to distinguish between the fact of a person being gay, and the fact of a lobby,” the Pope told journalists. As for the Institute for Religious Works, known by its Italian acronym IOR, Pope Francis said his decision about how to reform it is still up in the air. Among the options he listed are turning it into an aid fund, making it an “ethical bank” or closing it down. “I don’t know how this story will end. “But the characteristics of the IOR – whether it’s a bank, an aid fund or whatever it is – are transparency and honesty,” the Pope said, according to the Associated Press. Pope Francis also mentioned the need to delve more deeply into the role of women in the Church. “The role of women doesn’t end just with being a mother and with house work … we don’t yet have a truly deep theology of women in the Church,” he said, while underscoring that the ordination of women is not possible. Finally, the Holy Father offered the media a preview of his schedule. Two Italian trips, one to Cagliari and one to Assisi, are on his agenda for Sept. 22 and Oct. 4, respectively. But looking even further ahead, the Pope said he would like to visit Jerusalem and Patriarch Bartholomew I who has invited him, along with the Israeli and Palestinian governments. A trip to Asia is also a possibility, especially since Benedict XVI did not make it there, but the pontiff said it is only an idea at this point. He did offer the Philippines and Sri Lanka as the two likely candidates. 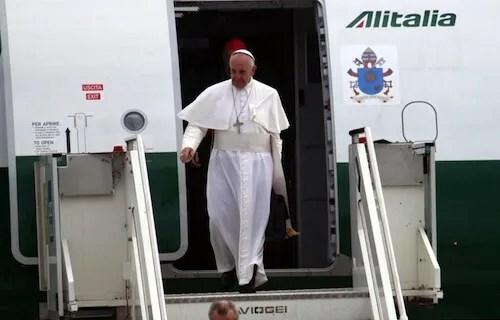 The papal plane arrived at Rome’s Ciampino Airport on Monday morning, and after landing Pope Francis paid a quick visit to Saint Mary Major Basilica in Rome to give thanks for World Youth Day. The Holy Father has now said so, therefore why is it that the archdiocese of Bombay is silent on this issue.It is understood that the nerve center of theis woman priest movement for India is at Bombay and a frew ladies who are closely associated with the Archdiocese, the bishop and even our dear cardinal are the main organisers of this movement. I believe the bishops of Bombay and Our Dear Cardinal Oswald Gracias knows these promoters of women priests who in fact take a very active part in all the church pastoral and administrative affairs.